Let me start with a quick introduction to Relic for those who do not have an idea about the original board game. 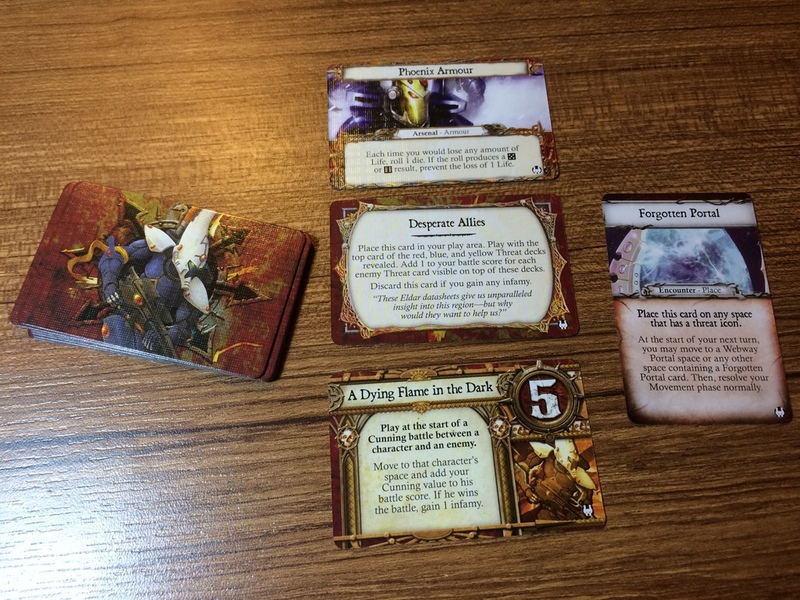 The game uses the setting of WH40k where players (2 to 4) take the role of largely Imperium aligned characters such as Techpriests, Inquisitors, Space Marines or Rogue Traders (called Characters) and traverse the 3 layers of the board to reach the center objective, all the while meeting the regular inhabitants of the grim darkness of the far future filled with war (I love alliterations). Characters have different traits that help them defeat the hostile encounters they meet and level up as they progress through the tiers and gather powerful artifacts called – you guessed it – Relics. These help the Characters reach the final objective in the center which may present even more dangers and challenges to face. Here’s an excellent introduction by FFG which explains the mechanics. Sounds exciting right? It got us hooked for hours every time we played the game. So without further ado, let’s switch to the expansion, Nemesis. Moarn Goreheart, pissed and ready for carnage. Pretty nifty fluff with a good look at what is expected from the contents. 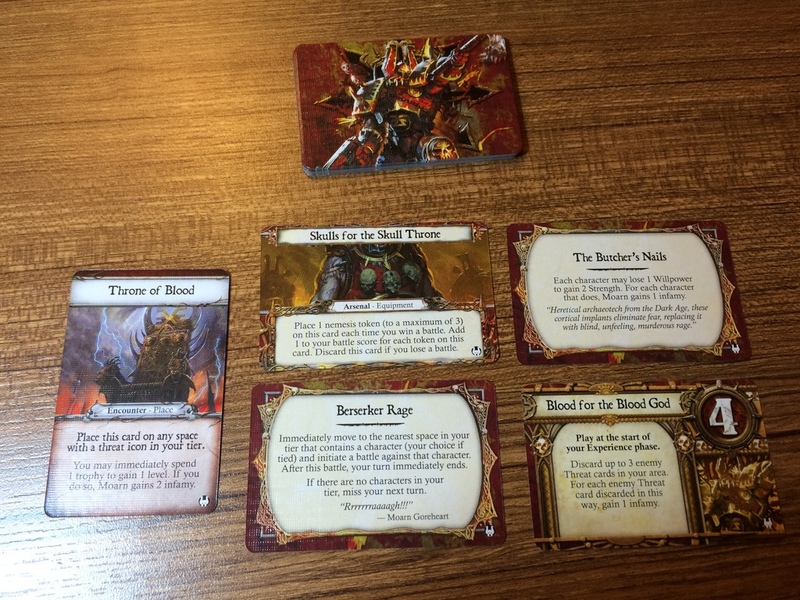 The game comes in a sturdy box with some great artwork of one of the Nemesis players in the expansion, Moarn Goreheart. The backside has some fluff that explains the new mechanics that comes with Nemesis and gives a good idea of the contents. The FFG catalogue for… 2013? More of Moarn. I love WH40k artwork. Opening the box you’re greeted with the rulebook and two bags of additional cards – New Relics, Encounters, Wargear and Power cards, both for the Imperial players and the Nemeses. 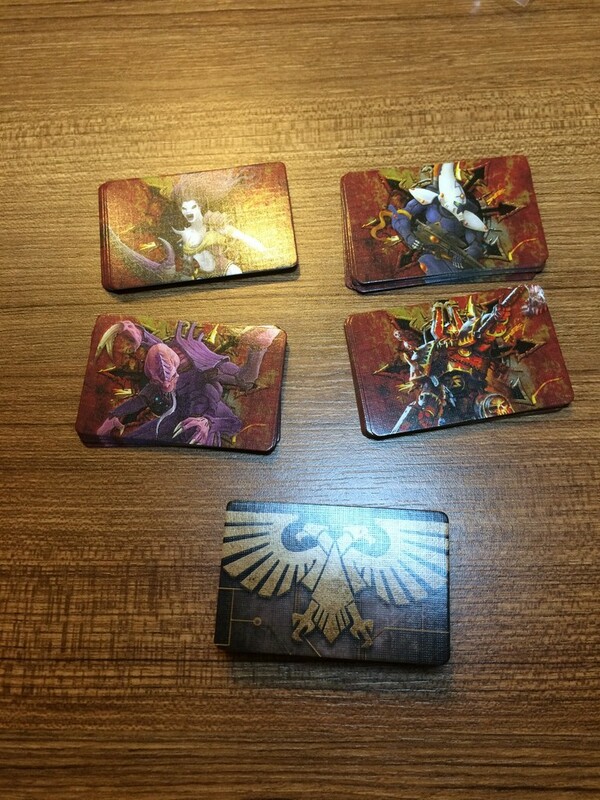 Additionally you get new Nemesis tokens as well as player tokens on top of the original pieces from the Relic board game. 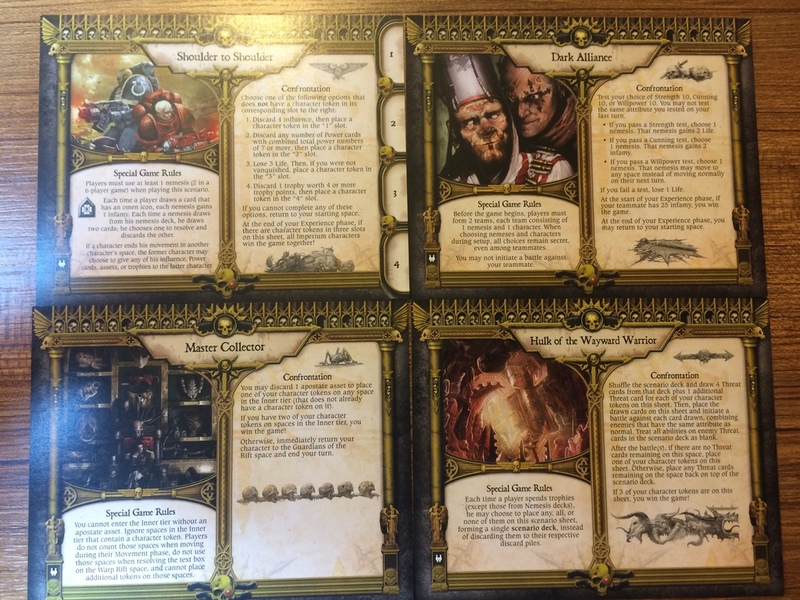 The rulebook is crucial to understand the new Nemesis mechanics and provides a great quick reference thanks to the back page. I really liked the fact that expansion cards are marked with a Khorne Berserker icon in a corner and Nemesis-only cards are aligned horizontally instead of vertically for the Characters. There’s also a winter catalog of FFG which confused me a bit. I guess the game is older than I thought. The full contents of the box. Instructions on how to assemble the level-up dials. Lots of fluff on the Nemesis characters. This is great for any WH40k fan! A nifty quick rule table, sure to be used in the first few games. Wargear, Relic and Encounter additions. Each expansion card has a little Berserker icon in the corner. Additionally, Nemesis only cards are aligned horizontally. Next up you get the additional scenario sheets for the endgame resolution – 2 scenarios for the classic Relic and 2 that introduces the Nemesis gameplay. In fact, the Nemesis scenarios are required to have any Nemesis players on the board at all, so this has a few tweaks in the game mechanics. More on this later. Nemesis scenarios on top, regulars on bottom. Lastly and perhaps most important for me, Nemesis comes with 2 additional Imperial aligned player characters and 4 Nemesis players, each with their own busts, carved in beautiful detail like their Relic counterparts, as well as the character sheets for each new player. 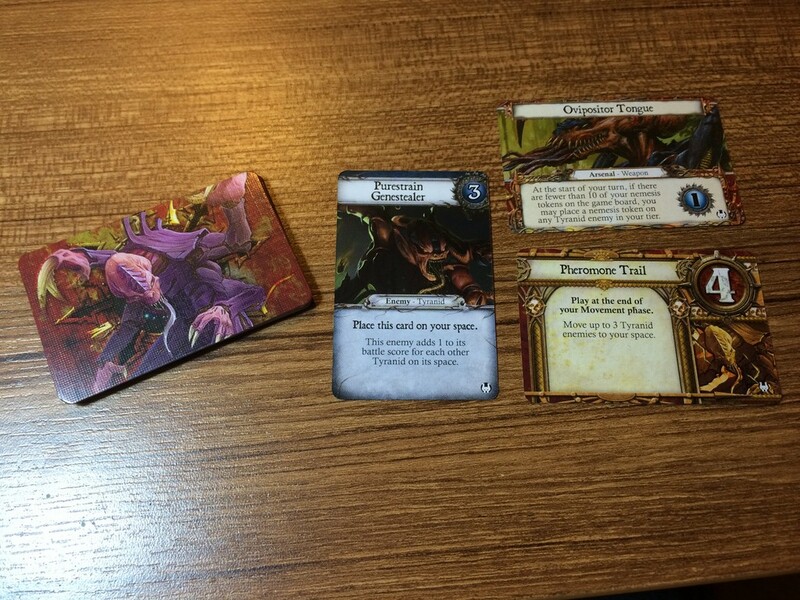 You also get 2 Nemesis level tracker cards and 2 level up pins, as well as bust holders for the Nemeses. 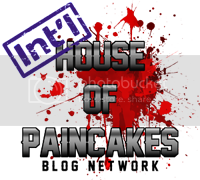 With this expansion the maximum number of players is raised to 6, with a maximum of 3 Nemeses operating in the game. If a 3rd Nemesis is used in the game (which requires a specific scenario sheet) then the 3rd player has to use pen and paper to emulate the stats of the character, which I found a little lame. I mean, why not create another level tracker just in case, it’s not a huge cost item anyways. Oh well, I guess they thought having 3 Nemesis players at the same time would be rare and limited to one scenario alone. Punchouts for the tokens, dials and the level-track cards. Moarn is oriented towards single combat where Specimen X relies on numbers. In case you forget your allegiance, just take a look at the backside of your card! And the busts themselves! These are the Imperial additions, Stormtrooper and Eversor Assassin. Here are the first Nemeses: Luxuria the Daemonette and the Eldar Dire Avenger. Lastly, Specimen X the Genestealer and Moarn Goreheart, the Berserker. In order to start play you have to assemble the new Nemesis level trackers. Each Nemesis has a favored stat as opposed to a variety of stats – Moarn the Berserker has obviously Strength as his main attribute where the Dire Avenger relies on Cunning and Specimen X has Willpower as a primary stat. In order to have these represented on the level trackers, the Nemeses get replaceable dials. It took me a good half hour to punch out and assemble the pieces without damaging them but I can see how they can quickly be destroyed after multiple applications to the main tracker board. Oh well, at least we have spare buds. An example replaceable dial, for Willpower. Inserted the backside wrong but you get the idea. The dial sits flush on the opening on the tracker. A fully assembled Nemesis tracker. Fully assembled additional Character trackers. There are 2 replaceable dials for each stat: Willpower, Strength and Cunning. Thus Nemeses have a primary stat and life as the only shared dials – the larger one represents infamy. The box contains spares for worn out buds for the replaceable dials. Nifty. So with the level trackers assembled, let us talk a little bit more detail on how game-play changes with the Nemeses present. First introduction of PVP (like in Talisman) is the Apostate vs. Devotee challenge. Characters who pick up the Apostate aligned Wargear can battle other Characters in skill duels to steal resources and gear. The other introduced PVP aspect is the Nemesis function, also called the Enemies of the Imperium game mode. In order to have Nemeses on the board one of the two new Nemesis scenario sheets must be used in the game. The first scenario, Shoulder to Shoulder, openly pits the Characters against the Nemeses, allowing the Characters to aid each other by exchanging items, assets or trophies. Nemeses have very powerful effects due to the scenario’s mechanics however, as they earn infamy on specific encounters. The other scenario, Dark Alliance, is a little more convoluted – Nemeses align with Characters where Characters try to make sure their Nemesis ally wins. This is pretty much my favorite among the new scenarios – balanced and awesome fluff-wise. This looks like it’s geared towards the max player situation – gotta try this out as well. Nemesis players, just like Character players, use the same mechanics of the game in terms of movement: roll a die and select a direction to move, resolve the encounter on the space and move on the experience phase. However the aim of the Nemesis player is different from the others – they openly oppose the Imperium aligned Characters and try to prevent them from resolving the inner tier scenario (except for Dark Alliance). For this reason they cannot traverse to the inner tier and are limited to the outer and middle tiers alone. In order to win the game, Nemeses try to gain infamy by using game mechanics: corrupting other players, defeating Characters and triggering certain events. Moreover, the Nemeses are not considered Players or Enemies and thus are not affected by the threat cards of the original game. Instead, they draw from the Imperium cards that have the Aquila on them – so the Nemeses encounter their own threats during normal movement, and fight agents of the Imperium! 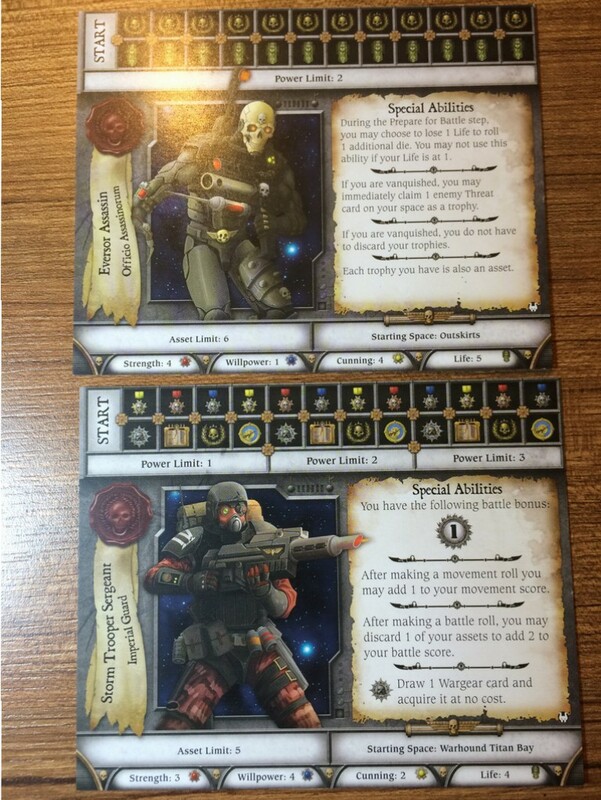 If a space has 2 threat card requirements, they simply draw 2 Imperium cards. If a space has text (special encounters that make the player roll for effect) they draw Nemesis cards instead and resolve them. This is crucial in determining where to land on the board. Think of the Nemeses almost as NPCs in your game – NPCs that can be very dangerous at times. 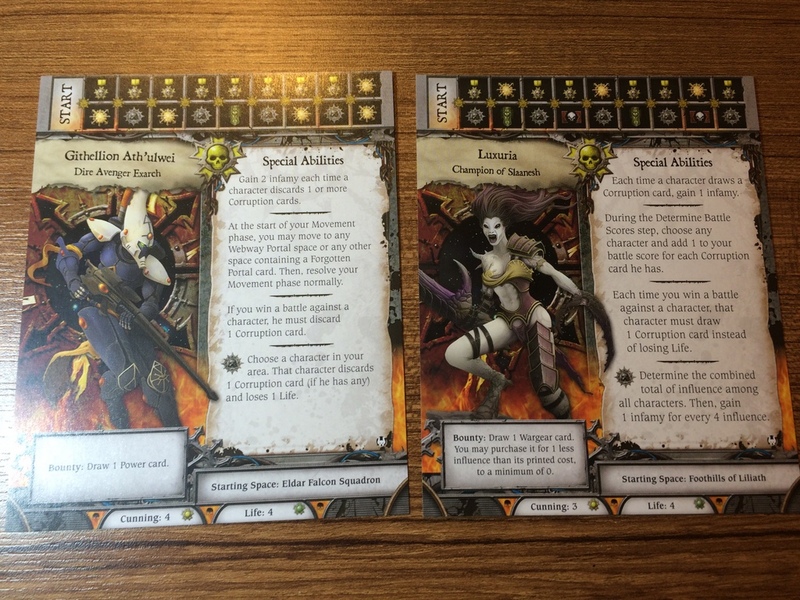 Nemesis cards are also counterparts of the Character cards – Threats become Imperial Agents, Powers become Might cards, Events that affect all players become Crisis cards and Nemesis-only Wargear are called Arsenal. And as said before, all Nemesis related cards are horizontally aligned. 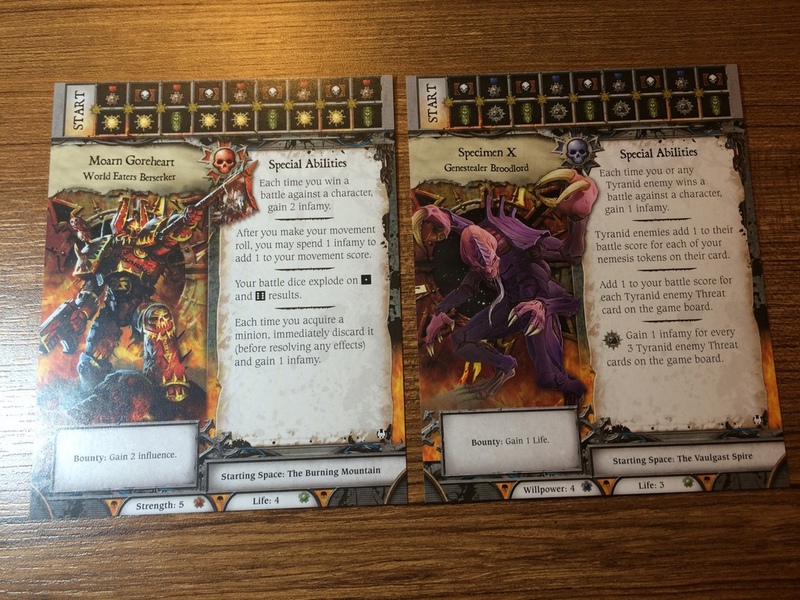 New Nemesis only cards including Imperium encounters! 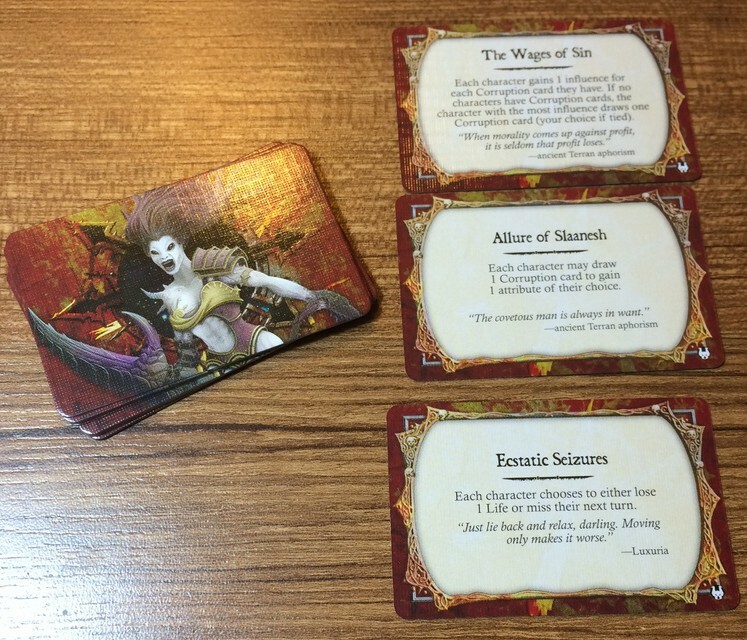 These are the decks that the Nemeses use when travelling across the board and resolving events. If a Nemesis player lands on a space with a Character in it, the Nemesis may encounter the Character instead! If this happens the Nemesis challenges the Character in battle using the Nemesis’ specialty stat. For example Luxuria has Cunning as her main attribute – thus any encountered Character must use Cunning as their attribute to fight. The fun part is that when battling other players like this the threat cards and Imperial agent cards on that space take part in the battle too! This adds to the strategy aspect of the game as well, as the Nemesis player gets a huge advantage if he/she lands on a space occupied by powerful threat cards and a previously defeated player for example. Similarly, Nemeses should watch out for Characters sitting on Imperial agent cards when determining the battle with the Character, as they assist the Characters during battle. Here’s the set of cards that work with the Character players, be it Apostate or Devotee. Each Threat deck receives 3 new cards and a plethora of Wargear and Relics are also introduced. The Wargear have some cards with green background – these are Apostate gear and allow skill duels between Characters. New Relics also have Apostate variants that are added to the decks. Nemesis comes with three new Threat cards for each deck color. If for some reason the Nemesis function is not your thing, the expansion comes with two new scenarios for regular players. The Hulk of the Wayward Warrior allows the players to accumulate defeated threat cards in the center. When a player reaches the center 4 of the accumulated enemies are chosen to fight in one titanic battle with the player. Considering that some enemies have very high attributes I can see that the situation may go out of hand very easily. The other scenario, Master Collector, is focused more on the Apostate vs. Devotee function and works a little like Yahtzee to traverse the trials again in order to accumulate character tokens. Imagine the trolling capabilities with a Trygon, Lucius the Eternal and other similar cards here. Tasty. I found this scenario a little mundane to be honest. Playtest may change my mind however! The game also introduces two additional Imperial players – the Eversor Assassin and the Imperial Stormtrooper. The Assassin does not incur serious penalties from being vanquished (life reduced to 0) and sometimes benefits from it by taking a trophy from the same space. However having trophies count as assets is a detriment as the limit can be filled up quite quickly if he picks up Relics and Wargear without leveling up through trophies. The Stormtrooper is a mobile player who has a constant battle bonus similar to the Ultramarines Captain from the original game and gains Wargear for free from specific level ups. The Eversor Assassin is a versatile character able to level up in any score where the Stormtrooper is strengthened by his assets and wargear. Corrupting and incapacitating enemies is her specialty. The Dire Avenger uses Eldar tech to protect himself and cleanse the board of the influence of Chaos. These two seem to be diametrically opposed to each other as one feeds off Chaos and corruption as the other seeks to eliminate the Ruinous Powers. Luxuria feeds off corrupting other players and causes Characters to either skip turns or lose life as well as offering devilish bargains to earn infamy. She also becomes more powerful the more corrupted other players are in combat. In contrast, the Dire Avenger is geared towards clearing corruption and causing damage to players who accumulated corruption on them, and earns infamy by this. Moarn is a mêlée juggernaut and thrives on combat. Specimen X brings buffs to the board for his Tyranid allies and in turn feeds off the successes of the Tyranid threats. While these guys are not opposed to each other, their play style is quite different from each other. Moarn is a Strength based Nemesis who earns extra infamy for defeated Characters and can sacrifice followers to Khorne for favor (infamy). Specimen X is to me like the color green in Magic: The Gathering – relies on horde tactics to spread Tyranid infestation and buffs the present threats. He also gets bonuses to combat for each Tyranid in play. Of all the Nemeses I find that Specimen X is the hardest to play simply because you’re more inclined to rely on the board, and your enemies may deny you the bonuses you seek by avoiding blue encounters that mainly house Tyranid foes. The casting process created a mould line, inevitable I guess. The plastic feels workable but quite solid on the thickest parts. The unpainted model looks a little silly with some casting errors on the details – should be no problem in fixing them with putty and knife. Similar mould lines appear on harder to reach areas but I had worse. Like the other busts from the original game the Character and Nemesis models are beautifully cast from hard plastic. There are some very glaring miscasts on the Stormtrooper and hard flash and mould line on the Nemeses but these should pose no problem to an experienced modeller. Compared to the original casts I’m a little disappointed – perhaps I was too hyped by the store pics of Luxuria and Moarn. Nevertheless, they’re a fine addition to a collector even if you don’t intend to play the game as it is not easy to find WH40k related busts from other miniature manufacturers in the market. That’s all for the review today – and I think I covered every aspect here. I hope to have some nice gameplay soon on this and will report on it when I do. See you on the next review! Wow those apostate items are ridiculously good, very tempting indeed! Did you get flash lines right across the face? That happened with my gene stealer…I was agast. Going to take awhile to clean that up! Yes! It goes across the mouth in a splitting move – very scary to put the blade in to scrape. At least I don’t have to think about it until I get some other projects finished. This tide of work really put me behind both in reading blogs and the hobby itself so let’s see when I’ll get around to tackling these beauties. Haven’t managed to play Relic yet, sadly, but this makes it look really awesome, thanks for sharing! It’s definitely a treat even in vanilla, I suggest picking this up for you as a fellow board game enthusiast. And with Nemesis it becomes real fun (I reckon)! Well if nothing else, I like the idea of playing as a Genestealer, that sounds wonderful! Definitely one that I want to try out soon, though, anyway!